Horneophyton had been one of the four land plants discovered early in the Rhynie chert . 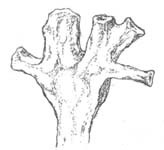 Nevertheless it has defied any attempt to group it with other fossil or extant plants, mainly because of its branched sporangia which are unique among all spore-bearing plants. Not only their shape is peculiar but also their interior: There is a central “tree” inside whose branches extend into the lobes of the sporangium. (A central column, called columella, is known from the sporangia of the hornworts. Hence, Horneophyton and the hornworts have something in common but the similarity of the names is incidental.) The peculiar build of the Horneophyton sporangium had been pictured in  as an obviously simplified schematic drawing (Fig.1). 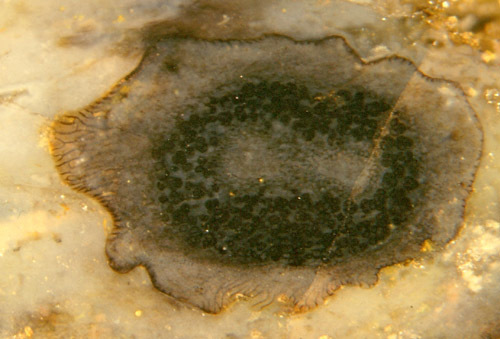 Fig.1: Horneophyton sporangium as usually pictured, from . 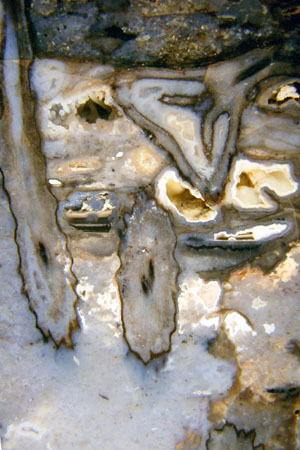 Fig.2 (right): Cut face of Rhynie chert with numerous sections of Horneophyton sporangia, with or without spores. (Sections of other parts have been omitted.) Note the pipe-like lobe (far left), the big bag with two small columella cross- sections (centre), and the thick base of the branching columella (far right). 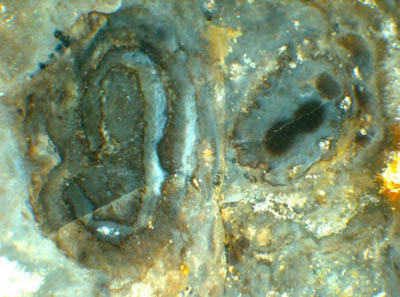 Two columella cross-sections seen in a two-lobed se ction (far left) indicate that the sporangium had four lobes at least. Disregarding evidence for more irregular shapes [2,3], the drawing in Fig.1 was redrawn many times, with slight variations for copyright reasons, apparently by people who never saw a Horneophyton sporangium in reality, and has been repeatedly published in palaeobotany textbooks and on websites as if it were the real thing. Although it is difficult to reconstruct a typical shape from the sections seen on cut chert faces in random orientation as in Fig.2, it became obvious soon that shape and size of the sporangia were distinctly variable and different from Fig.1. They can be rather simple with only one (?) or two lobes but never as regular as in Fig. 1, and possibly as odd-shaped as pictured in Fig. 3. With the combination of bulky bag and narrow pipe some specimens may even resemble a bagpipe. Fig.3: Tentative reconstruction of a variety of the rather variable Horneophyton sporangium, with the original principle of dichotomous branching modified by asymmetry, after own observations. Fig.4 (right): Cross-sections of Horneophyton parts. Right: shoot with shrivelled surface and forking central strand with two equal prongs not yet se parated, (fungus clot above). Left: Cross-section of a sporangium near its base where the broad columella is still connected to the wall on one side, and separate prongs are just being formed. The principle of dichotomy or forking as it is known from the shoots (Fig.4) is still there with the sporangia, as seen in sections near the base (Figs.4,5,6). However, a tendency towards asymmetry takes over soon. By the way, the transition from dichotomous to asymmetrical branching is an ancient phenomenon in several clades of the plant system. Fig.5 (left): Sections of Horneophyton parts: apparently simple-shaped variety of the sporangium with forking columella, shoot with forking xylem strand (below). Fig.6 (below): Cross-section of a sporangium near its base where the prongs of the columella are not yet separated; spores in clusters of four called tetrads. Note the epidermis cells on the left seen from inside. Width of the section 2.8mm. A conclusion may be drawn from the pictures: While Fig.1 suggests a similarity to the sporangia of the hornworts (and probably had been influenced by knowledge of the latter), the real shapes hardly do. Whether the odd-shaped sporangia evolved by the fusion of simpler ones or else by an increasing complexity of shape is still an unsolved problem. R. Kidston, W.H. Lang : On Old Red Sandstone plants showing structure, Part II. Trans. Roy Soc. Edinburgh 52(1920), 603-627. W.El-S. El-Saadawy, W.S. Lacey : The sporangia of Horneophyton lignieri. Rev. Palaeobot. Palyn. 28(1979), 137-144.